I did some yoga this week and I'm always awful at getting yoga regularly into my routine. Same here, so I've been trying to make it a focus for my week! It definitely helps a ton! Great week, Gretchen! Awesome that you can feel you're getting back to racing shape and had some great runs. That Open Streets class sounds great! And I love that you're biking so many places! Thank you! It's such a great feeling and really motivating. My half training starts in August so I'm really excited! You would have loved it! It was a ton of fun. Speed workouts have always been a lot of fun for me, which is probably why I still did well! Wow you killed it this week! 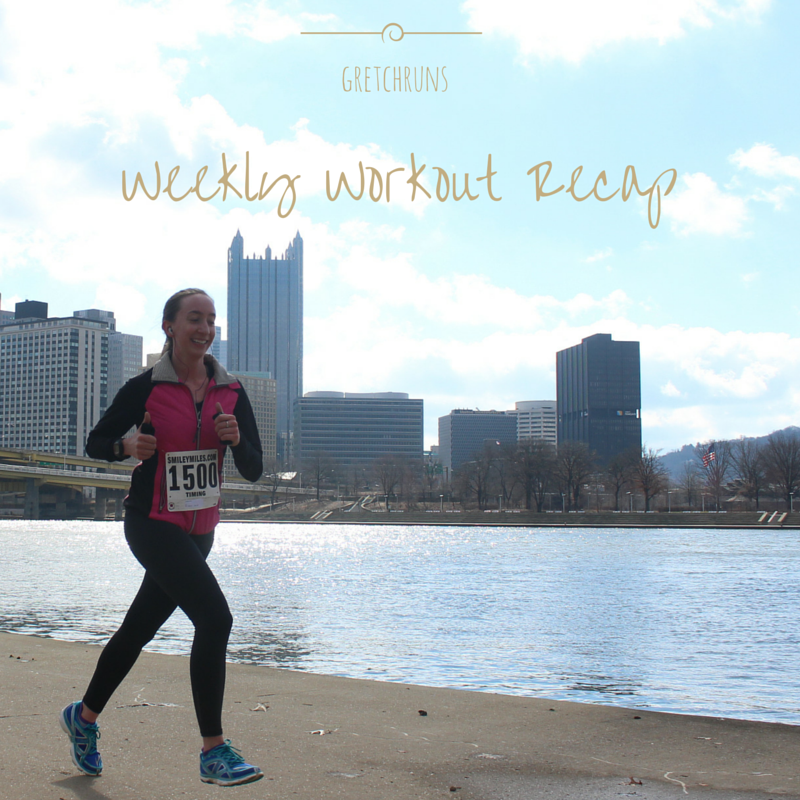 Running, biking, yoga, and strength training...is there anything you didn't do last week? I'm so awful about cross training. I always mean to at least put in some strength training...but that seems to only last a few weeks before I am back to just running. Thanks Heather! I'm really happy with how the week went..lots of different exercises. Hopefully I can keep it up! Cross training will definitely help out in your half training so hopefully you can fit it in! Your trail pictures are very pretty. I need to get to those places as a change of pace. I'm getting bored with the three places I've been frequenting and now that I'm comfortable with my healing I want to start branching out more and getting a little hill action. You had a great week and I'm really happy to hear you're liking the bike! I've done the same thing with random yoga videos.. if I'm not feeling it I have to stop it. Sometimes you just don't jive with the instructor or method. No biggie. Thanks Nichole! You're always welcome to join me if you're looking for a new place to run :) Glad to hear I'm not the only one who skips workouts when I try it online...sometimes it just isn't working! That's why I love taking classes in person..more accountable to finish! Loved your workout recap, you were super active! Scavenger hunt sounded fun and the trail pictures were very peaceful :) Since I'm NOT training for a marathon this summer, I have a little more time on my hands to cross train. I've been lifting a day a week (I know it's not that much) with my Husband and hitting Hot Yoga on Monday nights with my daughter. Its hard to fit it all in but I hope it helps my over all fitness in the long run. Honestly, I really just love running the most. Have a great week! Thank you! It was definitely a higher volume week than I'm used to, but was a lot of fun! Even a day of lifting will make a difference, and hot yoga is the best!! Which studio do you go to? Great job! I love your pics! I recently started doing the Iron Strength workout from Runner's World to help with my strength training. I also my enjoy Orange Theory workouts. Thank you! OTF sounds like such a fun and great workout. I have to try out the studio that just opened in Pittsburgh! Thank you Alison! It was definitely a tough week of workouts but all the variety definitely kept things interesting. I'll have to look for padded shorts! I'm sure that'll help out a ton. Thanks!